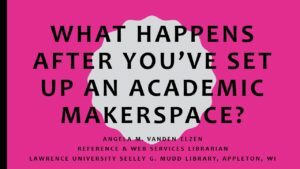 What Happens After You’ve Set Up an Academic Makerspace? Thinking of setting up an academic makerspace? Back in March, we presented on just that at LibTech: The Library Technology Conference at Macalester College. Take a look at our slides and notes– it’ll be almost like you’re there! A very abbreviated version of this presentation was delivered at the WAAL 2017 conference lightning round. This entry was posted in 3D Printing, Advice, Conferences and tagged academic library makerspace, conference presentation, Lawrence University, LibTech, Macalester College, makerspace management on July 17, 2017 by Angela Vanden Elzen.